From 18 May through 15 September 2019 the Kröller-Müller Museum is presenting the exhibition "Charlotte Posenenske. Lexicon of Infinite Movement". This first museum solo exhibition of Charlotte Posenenske in the Netherlands, will also present for the first time a complete overview of the spatial development in Posenenske’s oeuvre. Charlotte Posenenske (Wiesbaden, 1930-Frankfurt am Main, 1985) is one of the most important German minimalists. Her works consist of series in an unlimited edition. According to a number of rules, they can be made and repeated – also by others – and combined with each other. With her radical and ‘democratic’ ideas about material, production and authorship, Charlotte Posenenske influenced and shaped conceptual and minimalist art of the sixties. Charlotte Posenenske began as a painter, but she felt limited by the flat surface and soon moved on to creating spatial works. In 1967 she designed Series B, a series of concave and convex forms, angular and round, in the colours red, yellow, blue and black. The forms are hung as reliefs on the wall, but also placed as objects in the spatial environment. This is followed in 1968 by Series D and Series DW, which consist of square tube elements, created in steel and cardboard respectively, and whose format and shape are reminiscent of ventilation shafts. With both series, Posenenske makes a transition from autonomous objects towards works which have a direct relation with architecture and which sometimes even occupy the spatial environment. In later works, movement forms an explicit and integral part, as with the elements of Series E, which invite the visitor to become part of the work. Early in her career, Posenenske already had a connection with the Netherlands. In 1968 the reputed gallery Art & Project in Amsterdam introduced her work, which shows great affinity with the rational, sober views of Dutch artists, designers and architects. Posenenske also saw a connection between the Dutch landscape and minimalist sculpture, as is shown through her personal notes and her only film: Monotony is Beautiful, which was recorded on Super 8 during a trip through the Netherlands. Although Charlotte Posenenske did not consider herself to be a political artist, she had a clear and strong vision of societal relations, which in her view had to be rational, concrete, accessible and democratic. 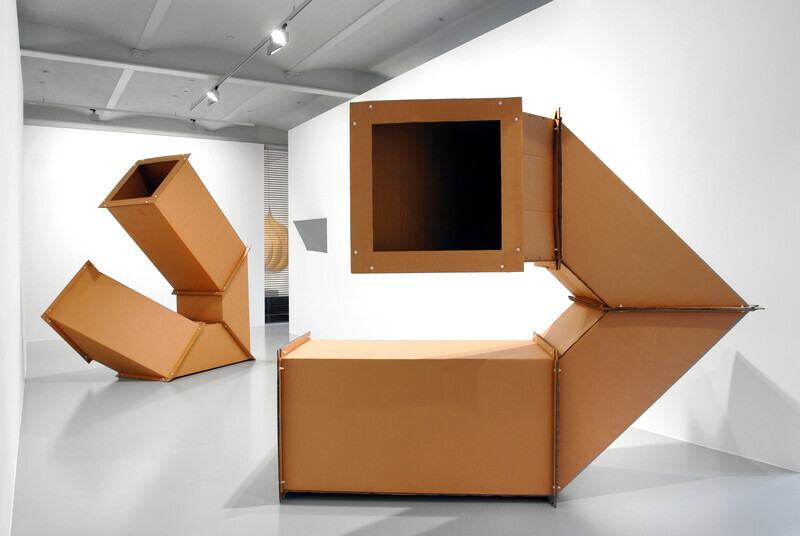 With her work she wanted to set a standard for this: the materials which she used like cardboard and steel are cheap, the works are sold for a fixed low price and the assembly and installation of her modular systems can be done by ‘everyone’: buyers, exhibition makers, and even the public. Posenenske’s social engagement is also expressed through the installations she created in public spaces, such as airports, train stations, conference rooms and on the street. Disappointed in the social scope of art, Charlotte Posenenske left the art world in 1968 to study sociology. Her work and views remain however points of reference for younger generations of artists. In the Kröller-Müller Museum, Ruth Buchanan (New Plymouth, 1980) and Yeb Wiersma (Groningen, 1973) react to the work of Charlotte Posenenske. Both artists investigate in their work the boundary between art and daily life. Ruth Buchanan creates a meeting of art, a performer and the public through an installation which can be seen in different spaces in the museum. Yeb Wiersma develops a new sound-work, in which she questions and disrupts the social views of Charlotte Posenenske. Charlotte Posenenske. Lexicon of Infinite Movement is curated by Suzanne Wallinga and Eloise Sweetman, in close collaboration with the Charlotte Posenenske Estate in Frankfurt. Suzanne Wallinga is a freelance curator. She is the co-founder and director of A Tale of a Tub in Rotterdam. A Tale of a Tub is a ‘testing-ground’ where artists and other (art)professionals get the time and space to do research and engage themselves in current social issues. Previously she curated exhibitions for institutes including the Frans Hals Museum | De Hallen Haarlem, CTM Berlin – Festival for Adventurous Music and Art (Berlin), TAG Institute for Audiovisual Art (The Hague), De Ateliers (Amsterdam), Art Rotterdam and EYE Filmmuseum (Amsterdam). Eloise Sweetman is a freelance curator, writer and teacher who investigates different forms of exchange, which results in exhibitions, publications and symposia. She is codirector of the exhibition space Shimmer in Rotterdam. Sweetman has worked with the Stedelijk Museum Amsterdam; Turning A Blind Eye, São Paulo Biennial; De Appel, Amsterdam; VER, Bangkok; Master of Art in Education, Piet Zwart Institute, Rotterdam; Political Arts Initiative and School of Missing Studies. She was editor for the Thai Pavilion during the 55th Venice Biennale and currently teaches theory at the Gerrit Rietveld Academie in Amsterdam. Ruth Buchanan comes from New Zealand and currently lives in Berlin. Buchanan’s work is primarily concerned with the different systems that play a role in the production and dissemination of culture, such as libraries, collections as well as artistic practices. Buchanan gives the meeting a central place in her work and she strives to strategically make visible and observable the social and political parameters of the moment. Buchanan has collaborated with institutes and organisations including Hamburger Bahnhof, Berlin; Tate Modern, London; The Showroom, London; If I can't dance I don't want to be part of your revolution, Amsterdam; the Gwangju Biennale, Gwangju; Badischer Kunstverein, Karlsruhe; Adam Art Gallery, Wellington. She has participated in exhibitions at institutes which include Institute of Modern Art, Brisbane; Kunsthaus Hamburg; Kunsthaus Bregenz; Auckland Art Gallery; Arnolfini, Bristol and Stedelijk Museum, Amsterdam. In 2018 she won New Zealand’s Walters Prize. Yeb Wiersma’s work is often transient in nature and besides public interventions is primarily physically expressed in scripts and choreographies. In her work she regularly investigates what motivates or moves people when they come together. Through he hybrid oeuvre, Wiersma creates sensory and imaginary conditions which allow scope for meetings with the unknown, the other and which at the same time question the relation between the past and now, fact and fiction, here and there, culture and nature. Wiersma studied at the Gerrit Rietveld Academie in Amsterdam and continued her education at Cooper Union in New York. In 2014, she was artist-in-residence at the Jan van Eyck Academie in Maastricht. Her work has been exhibited by institutes such as FOAM Amsterdam; Museum De Paviljoens, Almere; Van Abbe Museum, Eindhoven; Jinji Lake Art Museum, Suzhou; A Tale of a Tub, Rotterdam; Oude Kerk, Amsterdam; WEST, The Hague; Design Museum Gent.